Today, I give you this week's favorite things! It is finally October! I love autumn, but my absolute favorite month is October. It is when it finally starts to feel like fall, and all things Halloween finally make an appearance. Halloween is the best day of the year, so that means October is the best month of the year. Plus, there are some really fun Halloween races coming up in Chicago this month. Yay! Halloween is sooooooo close! New Shoes! I retired my old shoes following the Chicago Half Marathon on Sunday (I'll be posting my recap soon). They just had too many miles on them and were no longer comfortable. While my parents were visiting me, they asked what I wanted for my birthday this year. The answer? New running shoes, of course! Luckily, they just came out with a new version of my shoe, so the old version that I've been wearing was on sale and Fleet Feet had one pair in my size. It was meant to be! The last pair in my size, and they aren't pink. I win! My foam roller. I was hurting after Sunday's race, but my foam roller helped make everything better. I really need to get back into the habit of foam rolling on a daily basis. Foam rolling just hurts so good. Hannah likes the foam roller, too. 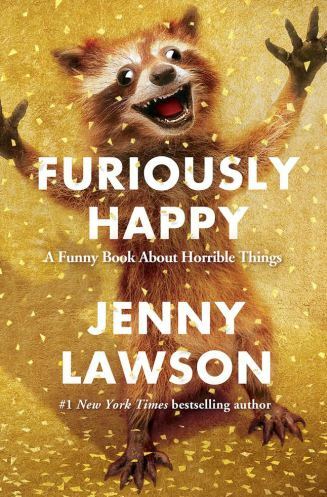 Furiously Happy. This book is seriously amazing. If you don't follow The Bloggess, then you should. She is real and honest and hilarious and just generally awesome, and her books are no different. A great cover for a great book. Movie nights with friends. Last night, my friend Derek and I made our way to the Music Box Theatre after work to see Goodnight Mommy. It was unsettling in the best possible way. Movies are always more fun to see with friends, and this was a great one to catch at the theatre. There is a certain magic to sharing an experience with others. I love the Music Box! It truly is a Chicago institution.